Now that Halo 4 has been out in the wild for over a week, it's proper timing to accurately assess its multiplayer prowess. I had a lot of fun messing around with the various modes during my review event, but how does being in a room full of gamers compare to lounging on my bed with my headset on? It's just as much, if not more fun. But I don't partake in public chatting. I pick a group of friends I want to play with and we dive in together, in the safety of our Xbox Live party. But saying "it's fun" isn't quite enough to depict what the multiplayer is all about. So let's analyze. You can break down Halo 4's multiplayer into objective-based modes versus straight-up killing modes. I'm much more of a killer myself, but I enjoy a good round of Oddball—where the objective is to hold onto the ball for the longest time—or Capture the Flag. You couldn't always hold a pistol in one hand and the flag in another in CTF. Capture the Flag is exactly how it sounds. Each team—red and blue—has a flag. It's your job to both protect your flag, and secure the enemy flag. The experience can vary drastically based on your team. I've been in lobbies where I've had to hold my entire team together as I desperately tried to play both the role of flag protector and flag stealer. But other times I found solid teams that followed each other's trail to watch over everyone's back. Oddball is a little more hectic. As opposed to dumping an object (like the flag) into one spot to score a point like you would in basketball (or Capture the Flag), Oddball has players hiding in corners surrounded by their teammates while they fend off enemies, or hopping around trying to avoid death. I played an entire round with zero kills and deaths because I held onto the ball from the start of the round while my incredibly adept teammates protected me. It must have been infuriating for the opposing team, but it was hilarious and exciting for us. Adrenaline really sped through my veins during that round, as I expected at any moment to lose our good luck with me getting hit in the face with a bullet. We were fighting against the odds, trying to stay hidden in the close quarters map called Abandon. I hid behind pillars, quickly swapping between them for the best, most hidden angle. Larger maps would obviously play much differently. Players tend to rely more on scoped weapons to take out the ball carrier from afar. Free for all Oddball is a whole other devil, best played on larger maps to get a real chase going. My personal favorite would perhaps be Haven for its many shortcuts. It's hard to keep up with where players are because they're constantly dropping down levels or turning corners and leaping across the map. Oddball is even more fun when you turn it into Grifball, though it's not an official mode. Yet. I'm hanging on for an update that includes it. The gist is about the same as Oddball, but everyone is equipped with the one-hit kill energy sword or gravity hammer and tasked with setting the ball down in a goal. It's hilariously fun to pass the ball to someone as they approach you for a kill, swing at them with your hammer and grab the ball back all in one fell swoop. I still get caught off guard when someone passes me the ball. I stammer a bit, forgetting that, hey that's an actual thing people can do, and almost always trip up because of it. Neat tricks and tactics like this, whether intentional or stumbled upon, are a big part of what make Halo multiplayer so fun. King of the Hill is my least-favorite objective-based multiplayer mode. You have to stand in a designated area for a designated time to control the hill. Each hill is marked on your map, so the mode basically just dictates where the next fight will be. The rush back and forth between hills often feels premature, like my work here wasn't done yet, but alas, you'll have to abide by the rules. There's some amount of tactics involved in that you can find a nice little corner to hide in, but it's not as fast-paced and aggressive as I like my Halo multiplayer to be. Dominion plays sort of similarly to King of the Hill in that the goal is to capture certain points on a map. But in Dominion there's an added layer of complexity that sees players fortifying their captured points with defenses like turrets and shields. Dominion is also special in that it forces players to play under pressure. Rounds will enter a Last Stand if/when all bases are captured by one team, after which the losing team will gain overshields but the winning team has to demolish them to gain the victory. That sense of urgency towards the end is the most exciting thing about Dominion. Extraction (a mode you can set up in Forge) is somewhat the opposite. Instead of securing a site, you're securing information from a beacon. You camp out near the beacon to defend it before the enemy team kills you. At this point, all these objective-based modes feel a bit washed out all lined up next to each other. Oddball is definitely my favorite, because it allows you to play Halo 4 a bit more silly than you might normally expect to. It also seems to be the best motivator for teamwork as far as I've seen in my random rounds online. Ah, here we go. That's the stuff. The plain, killing-machine-Jane modes are my favorite. Flood should be very familiar to veteran Halo players. 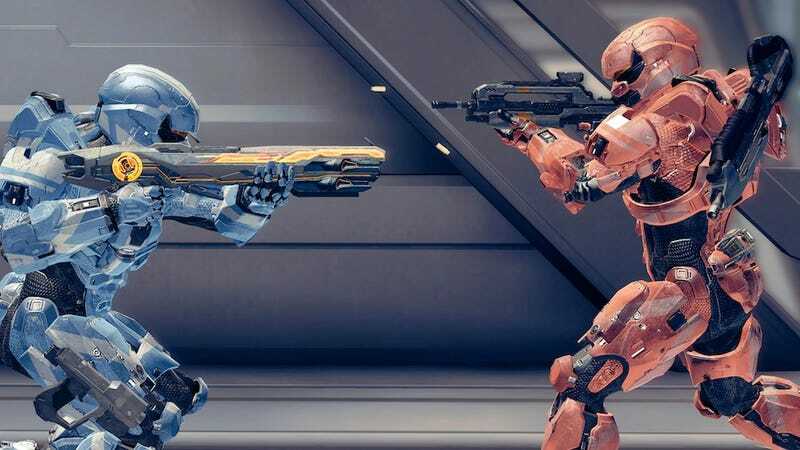 The game starts with mostly human, Spartan members while the several Flood players use either cloaking or boosting armor abilities to one-hit kill the humans. Once they land the strike on humans (who are equipped with shotguns and a pistol), they turn into the Flood themselves. It's fast, it's mean, it's thrilling. I like to get a human member on my side to combine armor abilities of Promethean Vision and Camouflage. I usually go for camo, so my partner will tell me what corner to expect a Flood rounding, and I'll crouch to sneak over and surprise him with a hit to the face. This mode escalates really quickly, which is why it's one of my favorites. Before you know it, you're one of the few humans left alive, with a scurry of Flood coming down the hills, or corridors. Facing back-to-back with the other survivor(s), you'll have to fend off a huge wave of enemies. You know you're going to die, but it's a test of how many you can take down with you. Regicide is another thrillingly awesome killing mode in Halo 4's War Games. The goal is to kill the king, or the player in the lead. Do that, and you get extra points for the assassination. The higher the bounty on the king's head—earned when the king lands more kills under the crown's name—the higher the points the assassinator receives. It's a cat and mouse chase that's constantly flipping and switching, so you'll have to play on your toes to keep up with its pace. The every man for himself mentality adds to the excitement, and has players on a constant shoot-out. Being the king is both a blessing and a curse. It means you're doing well, but a large icon will show up on the map, broadcasting your location to everyone. You know you're being hunted. You can only hope that players get distracted by each other along the way, and that you're quick enough to take out the ones that aren't. But what about the Slayer options (normal, Big Team, Infinity)? These are the traditional, team-based modes where one team kills the other team and the team with the most points wins. There are big maps and smaller maps. Windy, narrow-corridored maps, and open spaces perfect for vehicles maps. Though the variety certainly expands quite a lot of tactical playing options, I'd argue that there aren't nearly enough maps out right now. Of course, it's not unheard of for first-person shooters to receive map packs for DLC, and 343 has already announced incoming map packs, so this is a temporary problem. But as it stands I find myself running through the same set of maps all too frequently, and it's even more evident when playing rounds back to back (which I imagine a lot of other players are, like me, doing). Your Spartan's weaponry depends on the customization options you've selected. You can customize several loadouts to your liking, but the depth of customization at your disposal is limited to how many Spartan points you have to unlock them. As a new player, you'll level up very quickly, but the rush starts to slow down once you reach a ranking closer to the teens. It'll take more than a few hours to unlock every customizable loadout, and every weapon and armor ability you can customize them with. Getting the fanciest weapons requires real dedication, so it feels like it could be representative of how adept a player you are. You can do quite a lot with the customization to suit your needs. I like to have both my equipped weapons be primary weapons to swap between the DMR and Suppressor. I also like a speed boost and extra ammunition, but faster reloading is also handy. I often opt for the hologram armor ability in my loadouts, too, because while at first I didn't find them useful, you'd be surprised how often you can get people to fall for your decoy. Jetpacks used to be a favorite of mine in Reach, though I understand that wasn't a popular choice. In 4, they're suited best to the open maps like Longbow or Ragnarok so you can quickly jump up to platforms and buildings for an escape or a kill. Everyone plays differently. Some people like the jetpack or hardlight shield armor abilities. Some find the standard UNSC assault rifle or the needler to be overpowered. I'd argue that each weapon has its advantages and disadvantages, but others say it's a balancing issue. As you rack up points and kills in a round, you'll gain access to ordnance drops, which are bonus items you can call upon mid-battle. These range from super-powerful machine guns like the SAW to extra grenades and even an overshield. Bonus items can also be picked up on their marked locations on the map. This is a change from previous Halo games where a race to be the first to the energy sword would depend on how well you knew the map and where that item always spawned. Now they're clearly marked on the map, taking a bit of the fun out of the equation. You'll even know when someone has picked it up, because the marker will disappear from the map. You don't encounter as many spontaneous battles for an item as you have in previous titles. They're still incredibly convenient, especially if you're a new player just leveling up, but I haven't found myself as excited about picking them up as I was playing older Halo iterations. Ordnance drops can be tweaked if you're playing a customized map and/or mode. Happily, 343 has also recently added SWAT mode, a four versus four competitive mode (one-shot headshot kills, three shots to the chest, no radar) that gets rid of them entirely. It's also the perfect mode to fight out the DMR versus Battle Rifle argument. SWAT is perhaps the best mode to test out what reigns—the DMR's longe-range accuracy, or the BR's more rapid, deadlier fire. If you're more sniper-friendly than that, 343 also just recently added Team Snipers to the War Games mix. People have already been finding creative uses for items, too, like spawning an ordnance drop on top of another player to kill them. It actually works! Sometimes people's creativity is not so nice though, like when your teammate decides you can't ride the Mantis because they want it. Ever experience this? I've had multiple people throw grenades on me while aboard my mech just to wait for it to respawn to take for themselves. Regardless of how many unjust deaths I've been the victim of, it is fun to see how the community takes ordinary objects and uses them extraordinarily. It's just not always to the best results. The community in Halo 4 is, of course, hit or miss. One round to the next could entirely depend on the class of people you're playing with, which is why I try to even the odds by bringing a few friends into each game with me. But what I can say with confidence is that many of the multiplayer modes are well constructed and fun to play. You can find cooperative ones if that better suit your taste, or every man for himself killing chaos, which I happen to thoroughly enjoy. Now I'll wait patiently for unofficial modes to be turned into official ones, and for a few extra maps to switch things up.